In Seattle, when the wind begins to carry a chill and the leaves fade to warm hues, it’s time to find more things to do inside the house—and you’re in luck! 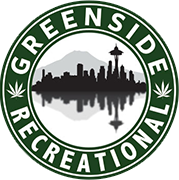 Because this week, Greenside Recreational has selected three great cannabis products that’ll be perfect for seeking asylum indoors. After a bong rip of this gloriously dreamy hybrid, you’ll be ready to throw on two seasons of Bob Ross on Netflix. It’s a well-established fact that Ross had the most soothing voice to ever grace a television program, and when it’s partnered with the thwap! of his paint brush? Words aren’t enough. Massive levels of the terpene alpha-Pinene are easily noticed in Bubbleberry’s pungent and piney scent. Pinene’s relaxing properties make this strain’s ideal for a day spent creating and laughing with loved ones. Let’s not lie to ourselves. If you’ve ever had wood floors, you’ve thought about—or actually attempted—to reenact Tom Cruise’s famous Risky Business dance scene. So next time you’re home alone, polish those floors, get out a pair of white socks, and cue Bob Seger. Because after a toke of Bay Dream, you’ll be ready to serve up some serious sliding action. Fireline’s Bay Dream is a phenomenal 60/40 sativa hybrid, and truly offers the best of both worlds. Primary parent strain Bay 11 promotes feelings of creativity and focus, while the other parent, Blue Dream, is ideal for the fit stoner. Together, they make for a crazy crossbreed that’ll make a one-man show feel like a party. Here’s an idea for a solid afternoon: Put a dab or so of Dabstract’s Blueberry Cinex in a handheld vaporizer, bump some groovy tunes, and head into the kitchen to make a delicious seasonal treat! We’re going to suggest something like this No-Bake Pumpkin Cheesecake because—safety first!—it doesn’t even require an oven. Since many Seattle citizens have alternative eating habits, we’ll also suggest this delicious Raw Caramel Apple Pie. If you’re a vegan, or just want to make sure you take care of every member of your crew, it’s essential you whip one up. Many will find the sweet and earthy flavors to be both welcoming and uplifting, meaning Blueberry Cinex will also pair well with chores. But actually? Forget the chores. Fill the house with small decorative gourds, light that cinnamon apple candle, bust out the glue gun, and go to town. Oh, and don’t forget the candy corn.